Let's hope this flight attendant is fired soon. She deserves it. Until then, there are other airlines. US Airways has sparked outrage after a flight attendant allegedly refused to hang up an Army Ranger and combat veteran’s jacket to stop it from creasing. First Sargent Albert Marle was wearing a jacket lined with medals when he boarded Flight 1930 from Portland, Oregon, to Charlotte, North Carolina, yesterday. But when he asked an attendant to hang up his ‘Dress Blues’ uniform, she reportedly refused, saying the coat closet was for first-class passengers only and he was seated in coach. ‘Her response wasn’t that there’s not space in the coat closet or “I’ve hung too many jackets up”,’ said Brian Kirby, a first-class passenger on the four-hour flight. 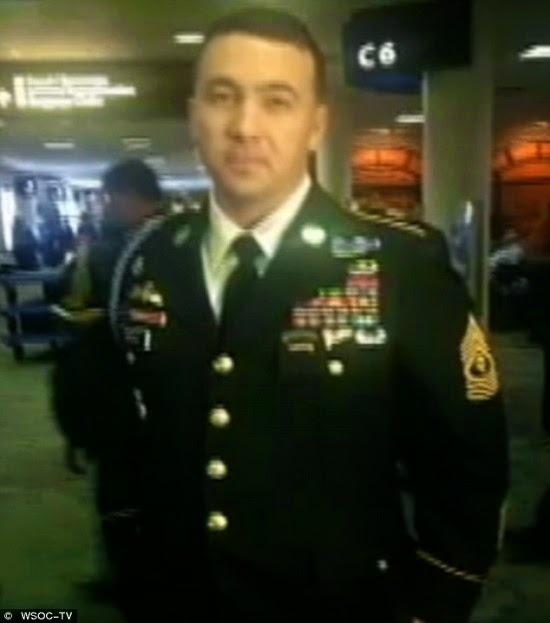 Shocked first-class fliers then offered their seats to Sgt Marle, but the decorated soldier politely declined their offers and remained seated in coach, passengers told WSOC TV in Charlotte. Some even claimed the flight attendant shouted at fliers who tried to ask other attendants to hang up Sgt Marle’s decorated jacket to prevent it from wrinkling.